Generate a PDF of this technology. Scientists at NDSU have developed a device for improved CAR T cell production, which speeds the turnaround time by enabling CAR T cell production ‘on-site’ at a hospital or cancer clinic. The NDSU device is small and disposable. The device expands a patient’s T cells, and is then used to transfect them. 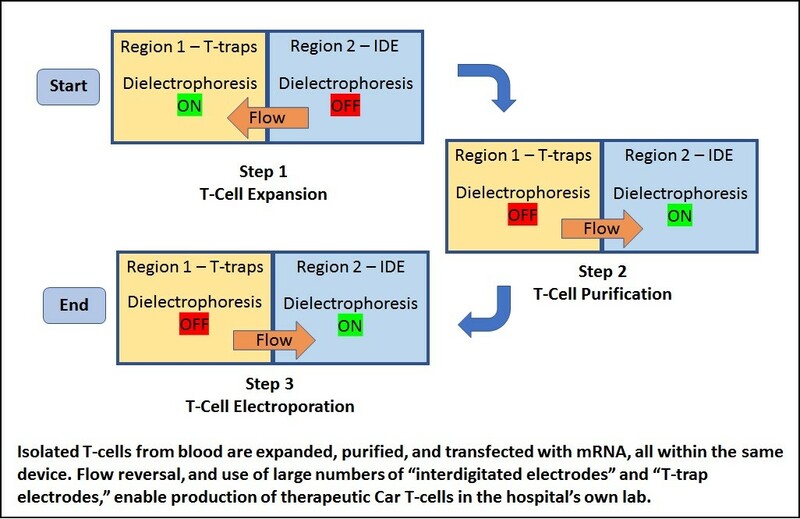 Further, the cells are transfected with CAR-producing mRNA, for transient production of CAR for about 2 to 3 weeks. Because this process takes place at the clinic, a physician can a have another treatment ready when the preceding treatments winds down, and the physician can also adjust each treatment (number of CAR T cells and CAR molecules per cell) to optimize treatment of the existing cancer while minimizing adverse effects. The NDSU device doesn’t use viruses and there is no genome modification of T cells. This technology is patent pending in the U.S. and is available for licensing/partnering opportunities.